Lenny the Tarantula lives at Zurlington Zoo. He’s “furry and fuzzy and hairy” and he likes to play tricks on people, especially his favourite trick, Tarantula Boo, where he jumps at people. The only thing that’s missing is a friend to share his scares with, and when a flying coconut breaks the glass on his cage, he escapes to go and find a friend. Lenny looks all over the zoo, but will he find someone who isn’t scared of him or tries to eat him? lived loveable larrikin Lenny Lassoo. and liked to play tricks that were frightfully scary. Children will love Lenny and they’ll laugh as he jumps out at people and animals. Philip Webb’s illustrations perfectly match Lucy’s descriptions and make Lenny funny, rather than scary. Tarantula Boo! is a book that parents and teachers will enjoy as much as the children and won’t mind reading again and again. 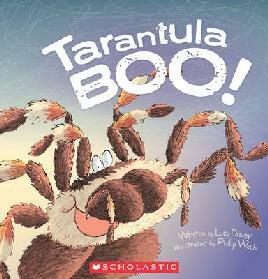 Tagged as Lucy Davey, Picture Book Nook, spiders, tarantula, Tarantula Boo!